FS: Grey cloth M-Cross and Dove grey leather rear seats! Grey cloth M-Cross and Dove grey leather rear seats! Both of my rear seats are for sale as they're taking up valuable space! I have no intention on installing them in my E36 M3 as I have recently installed a children's play structure in the rear of the car. Condition 7/10 - Overall very good: especially considering it’s age! Cloth “M-cross” fabric is in great shape absent of tears or abrasive wear. Minor fading as expected on the upper portion of the rear bench due to sun exposure. This ofcourse is hardly noticeable once installed due to the light color of the fabric. The Amaretta “suede/alcantara” is also in great shape. One minor hole is present on the driver side seat back. This ofcourse can be easily remedied by any interior/fabric repairman. I have done my best to disclose any imperfections; but feel free to send me a message with any photo requests. This rear seat is very difficult to find and is perfect for those searching to complete their rare interior or have a spare just in case. 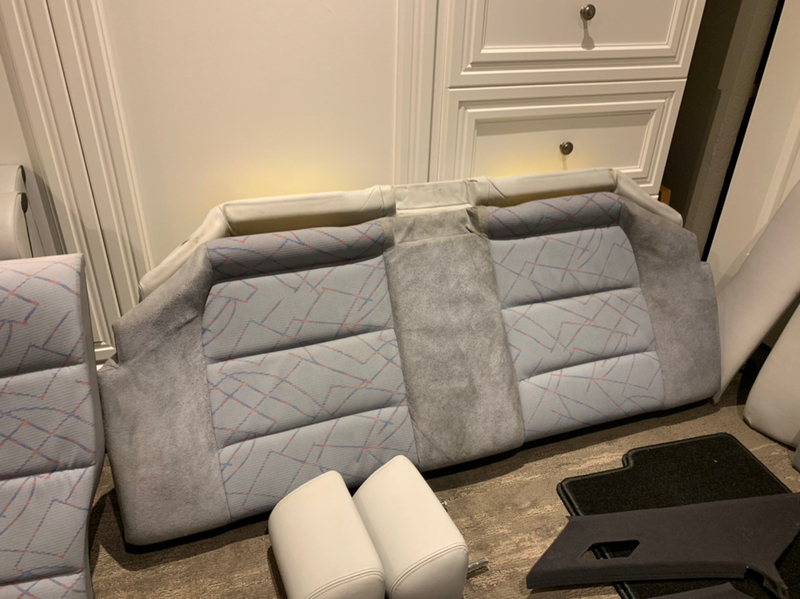 Excellent Dove Grey rear seat from my 1999 BMW M3 coupe - Rear headrests included! Condition: 8/10 - About as good as it gets for a car in the 100k mile range. No seam splitting, always conditioned and hidden from UV rays in the garage or under tint for the past 7-8 years. Leather is soft and supple. There is minor cracking present and as expected for any 20 year old leather. None of which is deep or out of the norm. I have done my best to disclose any imperfections; but feel free to send me a message with any photo requests. This rear seat is difficult to find (In this condition) and is perfect for those searching to complete their interior! Shipping can be arranged however I will only be shipping in the Contiguous US at this time due to fees. I am located in the Bay Area and would be happy to show the seat to interested parties. If shipping is necessary; It will be a flat fee of $220 due to size/weight. Last edited by Toodaloo; Sat, Jan-12-2019 at 07:20:56 PM. Re: Grey cloth M-Cross and Dove grey leather rear seats! BUMP! Leather seats sold. Throw me an offer for the M Cross rear! All times are GMT. The time now is 08:42:01 PM.